It’s no secret that loyalty programs — like those hole-punch cards that give you a free Slurpee every ten visits — are a great, cheap way to keep customers coming back to your business. Thing is, running these programs isn’t always as easy as it seems, especially if a business wants to do something more complex than the basic “buy ten get one free”. PlacePop is a new startup looking to make these loyalty programs accessible to any business: the startup has built a self-serve platform based around its new iPhone application which companies can use to distribute virtual, custom-branded loyalty cards. Today, the company is launching at our Social Currency CrunchUp, and it’s also announcing that it has closed a $1.4 million round of funding. Participants in the round include Affinity Labs Founder Chris Michel, Bebo Founder Michael Birch, and James Currier and Stan Chudnovsky, both of whom cofounded Ooga Labs. At a high level, PlacePop is pretty simple for the end-user: you fire up the iPhone app, swipe until you find the appropriate virtual rewards card, and “check-in” at the venue you’re visiting. And the startup says that a business can get its loyalty program up and running in five minutes. PlacePop isn’t the first startup to try to tackle rewards, and it faces the same chicken-and-egg issue that its competitors have: you need businesses to actually offer rewards to get users hooked, and businesses aren’t going to bother if the service doesn’t have any users to begin with. PlacePop is taking a few steps to deal with this (and help differentiate the startup): first, it offers a number of other social features, like sharing photos of the places you’re checking into so the app has some utility regardless of if a business is offering a deal or reward. And second, it’s letting you earning rewards points toward venue on Earth, even before a business joins PlacePop. That may sound a little counter-intuitive, but PlacePop is hoping that it will lead to a sort of community-led guerrilla campaign where users urge their favorite businesses to join PlacePop. CEO Kent Lindstrom explains that users can start checking-in at their favorite restaurants and other venues, and when venue owners visit PlacePop and see that they already have traction on the service, they can “claim” their profile. I’m not entirely convinced this will work (it’s going to get tough to convince users to check in based on the possibility that a venue may one day start offering rewards), but it’s an interesting tactic. So why would a restaurant want to use PlacePop instead of a service that is already starting to get traction, like Foursquare? 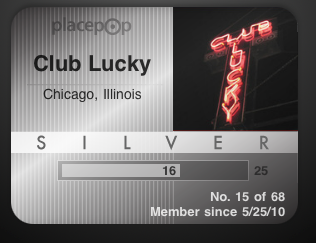 Linstrom gave a few reasons: first, PlacePop allows venues to customize and create their own branding for their virtual card. Second, the platform will allow venues to custom tailor how they want to reward program to work — for example, a business could opt to build their own Groupon-style program, where a special deal was activated if 50 people redeemed a coupon. PlacePop obviously has its work cut out for it. Foursquare and other location-based services are looking to add deals and rewards as a layer on top of their applications, allowing for a more passive approach to earning rewards. Other startups in this space include We Reward, which lets you earn cash for your checkins.